Right lads, let’s look at the crud on your face and how to deal with it. Don’t be shy, we’ve all got some, and most of it could do with a bit of gentle sandblasting from time to time. I’ve looked at quite a few Glycolic Acid skin peels in recent years. It’s one of those trends that originated as a specialist treatment in salons and is now widely available for at home use. If you’re new to these, don’t be scared of the word “acid” in conjunction with your face. This is fruit acid we’re talking about, and it’s not very acidic at all. Exfoliating masks refresh the skin and are a gentler alternative to physical exfoliants (ie anything with scrubby bits). 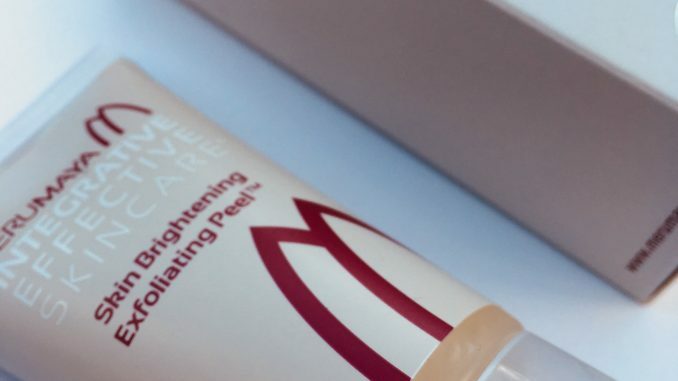 This week I’ve been trying out the Merumaya Skin Brightening Exfoliating Peel, a favourite of actress Kara Tointon. It combines glycolic acid and pomegranate enzymes to remove dry skin and blemishes. Merumaya put it a lot more elegantly than this, but what it boils down to is de-cruddifying your skin. And it really feels great to de-cruddify your skin. Alas, skin being skin, it won’t stay that way and you’ll have to repeat the process soon enough. But that feeling of a lovely smooth face is quite addictive. You’ll be inviting your friends round to admire it. There is up to 11% glycolic acid in the Merumaya mask, which works to remove surface debris and dead skin cells, and encourage new ones to grow. Putting that in context – Pixi Glow Tonic, an exfoliating toner designed for daily use, has around 5% glycolic acid. If you were to go for a professional chemical peel then they might use around 30% glycolic solution. So this is stronger than a daily treatment and can be used 1 to 3 times a week. Compared to other exfoliating masks I’ve used, this felt slightly gentler because there was no skin tingling or excessive redness afterwards. You can leave it on anywhere from 5 to 15 minutes, then the smooth gel formula washes easily off. Masks like this are better if you do them at night, and you must, must, must use sun screen the next day. The baby-soft, renewed surface of your skin is more vulnerable to sun damage, and if you don’t protect it then it could end up worse than when you started. Although this is an at-home skin peel, it’s not like your skin’s actually going to peel off. If you’ve never used an acid exfoliant before, don’t be scared. Once you’ve used it, any products such as serums, moisturisers or make up will apply better. It’s great for getting your skin looking more radiant, getting rid of blemishes, and reducing the appearance of pores. Apparently it also prevents ingrown hairs for men. Alas it does not make you a cup of tea, so I’m still searching for the holy grail on that score. Merumaya is currently celebrating the Chinese Year of the Dog by putting a fortune cookie in every order until Feb 28th. Each fortune cookie contains a prediction and a gift!